Noodles! China's Latest Weapon In The War Against Rural Poverty : Goats and Soda Lessons in noodle-making is one of the ways that China hopes to eliminate rural poverty by 2020. 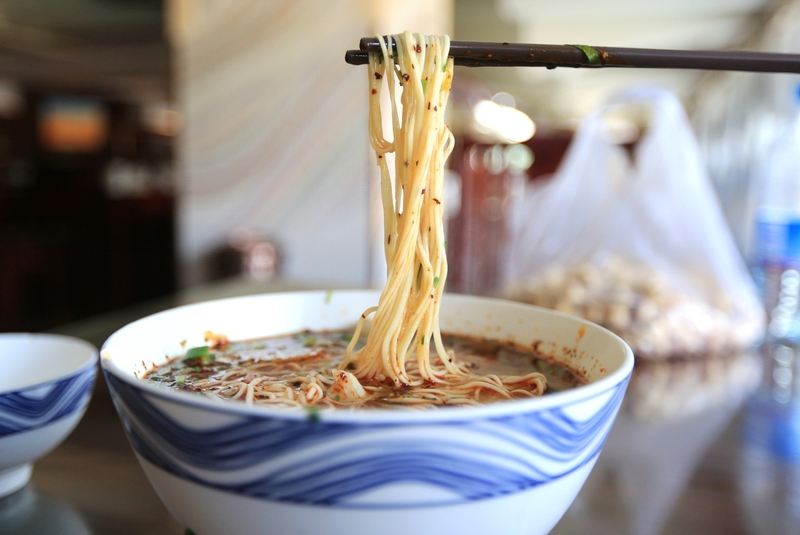 Beef lanzhou noodles are a famous food in China, typically in the northwest area. Give a man a bowl of noodles and you feed him for a day; teach a man how to make noodles and you feed him for a lifetime. That's how the famous proverb about fish is being reinvented in China these days. In the northwestern Chinese province of Gansu, the government believes that one way to eliminate poverty is tied to the region's specialty dish — hand-pulled noodles in a beef broth. The chewy noodles, made from flour and water, are a popular dish, bathed in clear broth and topped with spice-braised beef, fresh cilantro, green onions and hot chili oil. A bowl goes for as little as 8 yuan — about $1.50. In mid-March, Gansu province authorities announced that this year they will train 15,000 people from impoverished areas to make the noodles from scratch. The hope is that these new noodlers will land jobs at noodle shops or open their own. The government will offer financial incentives to companies and individuals to meet the goal of opening 1,500 new noodle shops in 2019. It's not the first noodle initiative. Last year, some 12,000 people joined the noodle skills training programs in the province's capital city Lanzhou and in Beijing. According to the government, 90 percent of them found noodle-related jobs after. Those who left the province for noodle work are earning more than 4,000 yuan (about $590) a month. There does seem to be a lot of opportunity in the noodle field. China has an estimated 50,000 Lanzhou beef noodle shops, 4,000 of them in the poverty-stricken Gansu province. According to the provincial commerce department, the annual noodle shop sales volume in that province alone is 12 billion yuan (about $1.8 billion), and the region employs more than 40,000 noodle-makers. But there is only so much that noodles can do in the war against poverty. And President Xi Jinping is putting on the pressure by vowing to eradicate rural poverty by 2020. There are 16.6 million rural poor in China. In Guizhou, the country's poorest province, the local government has partnered with private enterprises to develop tourism. Wanda Group, a high-profile Chinese property developer, allocated 1.5 billion yuan (about $223 million) in Danzhai county, building a tourist village to showcase the architecture and dancing and singing performances of the ethnic Miao and Dong minorities. In addition, the county established a vocational school to teach tourism management, nursing and accounting skills. The tourist village appears to be generating jobs. Within a year of its opening in 2017, the state media agency Xinhua reports 5.5 million visitors from outside cities. The tourists took time out from posing for selfies to devour local dishes (which is good news for pig farmers, among others) and buy local products such as tea and crafts including embroidery. According to Xinhua, in that first year of operation, the village has created 24,000 jobs, and some 16,000 people increased their monthly income to 3,000 yuan ($440), which puts them way above China's official poverty line of 2,300 yuan ($340) per year. Sometimes, it's the people themselves who find opportunities and help themselves. Folks in the Beishanyun village of Shanxi province, which is home to more than 30 courtyards built in the Ming and Qing dynasties, have turned to acting for extra cash. The farming village's traditional architecture has reportedly made it a desirable shooting spot for film and TV dramas set in the Republic of China and Sino-Japanese War periods, roughly 1912 to 1945. Working from 8 a.m. to 6 p.m. as an extra brings one 100 yuan ($15) per day. Some families can earn a good amount in a few days if all its members work as extras. Meanwhile, the noodle-making dreams in Gansu province may have some bumps ahead — at least that's what people are joking about on Chinese social media Weibo. "Most Lanzhou beef noodle shops in the country are run by people from Qinghai province," joked one Weibo user. "Is there any space left for Gansu folks?" "Gansu people are finally getting the hang of it, years after Qinghai took the special away from them," another said.